The team at Pilot Salt Lake City is settling into its new space since moving in April. The operation had outgrown the previous location, so a bigger, more efficient facility was secured. SLC is now strategically located 10 minutes from the airport and next door to Forward Air, an important partner. A larger warehouse space and more loading docks were also needed. 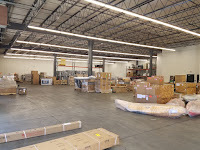 SLC’s new home has both with 20,000 square feet (double its previous location), nine dock doors and one ramp door. Expansion is also possible. “We have first right of occupancy to the adjacent suite which will allow for an additional 4,000-square-foot warehouse and two more dock doors,” says Pilot’s SLC district manager.